These poor teachers, who have not received their salaries for the past seven months, had no option but to start a mass demonstration which was also supported by at least one thousand students. 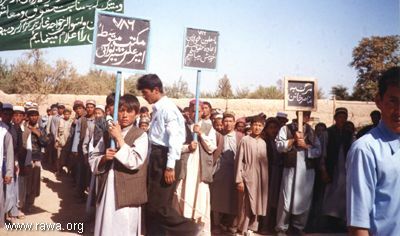 Despite years of being denied education by the Taliban and Jehadi oppressions, even the girls' schools joined the demonstration to show support for the cause of their teachers. 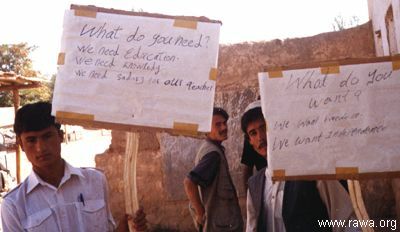 The ordinary people of Takhaar, including the shopkeepers and businessmen, also came out to the street to show their solidarity with the unpaid teachers. 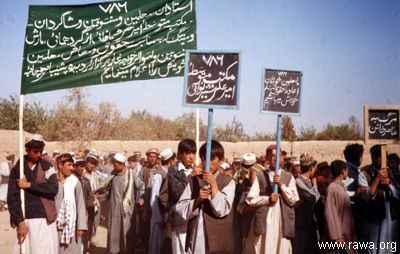 These demonstrations lasted for three days and attracted supporters from other villages including Hazar Baagh, Zard Kamar, Mang Chooqor, Jugdo and Toghli. 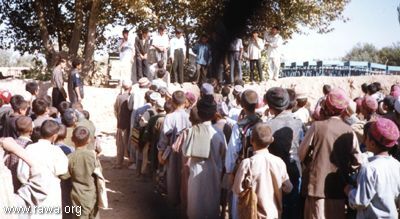 The demonstrators delivered speeches against the local government and the speakers included students from both the girls' and boys' schools. The demonstration came to an end after three days when a resolution was proposed and they announced that schools will be closed down for 10 days. It was very significant to see all the people of Khwaja Ghaar, including businesses and ordinary people, supporting the teachers' cause. However, it is unfortunate that no international news agency was present to broadcast such a significant matter to the world so that the people of the world could be aware of such crimes. 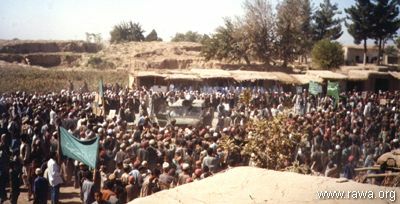 In Khwaja Ghaar many international NGOs such as Concern, Acted, Shelter Now and Hallo Trust are operating and they all witnessed these demonstrations because their vehicles could not pass through the blocked roads and yet these organizations turned a blind eye to these events and did not try to pass its news to any news agency despite having modern means of communications. RAWA, as usual, has taken photographs of these events in order to inform people around the world of the suffering of our nation at the hands of the corrupt fundamentalists.